As the wind chills and skin wilts, food cravings also change their patterns. While summers develop fondness for icy drinks that cool you down and light cuisines that are easy to digest in the heat, winters make way for the hot and heavy to shield your body against the cold temperature. A little use of creativity and imagination can turn your traditional recipes into a perfect dinner menu. Celebrate the winter season with simmering soups, grilled recipes, oven baked casseroles and warm desserts but remember that the food we consume in winters should be adequate to moist our body and systems like our joints, membranes and skin. To protect ourselves from drying out reactions of skin and body and to keep the body nourished super winter foods like bananas, assorted nuts, fish, beetroot, cabbage, oranges, healthy fats and meats should be a part of your winter diet. In this article you will find delicious winter dinner menu ideas for home food lovers which are rich in taste and nutrients to make your dinner table a feast every day. 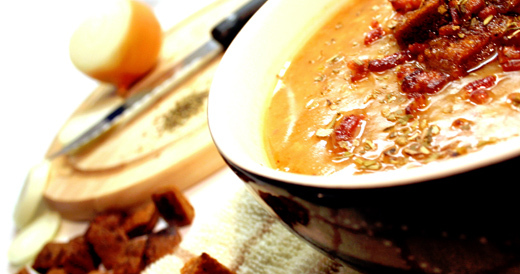 Beginning of winter night dinner with a perfect appetizer and brewing up a classic soup is a great idea. Contemporary chicken corn soup is light on the digestive system and quite fulfilling, while the classic tomato soup would appeal more to those who have a liking for herbs and flavor. You can also try vegetable and cream soup which becomes rich and a well-sated course. Toss together your favorite vegetables with a nice thousand island dressing to add a wintery touch to your winter salad as a wholesome dinner is incomplete without one. A more festive idea for winter dinner menu appetizer would be to grill chicken wings marinated in tandoori masalas and served with a garlic mayo sauce. Hummus served with crisp bread and cheesy garlic bread is another mouthwatering starter for a winter dinner menu. Deciding on which course to take for the main dish during winters may turn out to be rather easy as there so many recipes that food lovers want to try at home, but avoid because of the hefty calorie count. However, all is fair in winter. I am not justifying weight gain in winters but a little exercise can help in shedding those extra pounds easily. Try chicken casserole in cold winters and it will take you to a journey of luscious tastes. Lasagna is also a great option that would add Italian exuberance to your dinner table. Besides this; fried or grilled fish served with chips and sauces, grilled steak, vegetable stew, Chicken or vegetable white sauce Pasta, Chicken and cheese rolls, roasted meat, chili chicken, lamb chops with lemon and herbs can be ideal for a winter dinner table. Then again, if you feel like giving away to the winter chills without compromising on food and taste, resorting to Chinese cuisine is the perfect way out as it takes less time and is easy to make. Winters mean pampering yourself. Leap over the healthy, wealthy and wise line and coddle yourself with cakes, crumbles and pies. Make your own desserts this winter and surprise your family with what magic you can create at home. Oven baked pudding, warm brownies with chocolate sauce and apple pie. Keeping the tradition alive you can also go for shahi tukray, Jalebi, sheerkhorma, Gulab jamun, Gajar ka halwa, sooji ka halwa, vermicelli with nuts, Zarda biryani loaded with nuts and much more. Hot drink cravings in winters are a must. Sipping your herbal tea while munching dry fruits or having coffee while watching your favorite show on television, ends a winter night in excellence. Besides this hot chocolate, ginger tea, warm fruit punch, fruit tea, nutty Irishman coffee are some royal and magnificent ideas to keep yourself warm in winters and complete the season menu ideas.